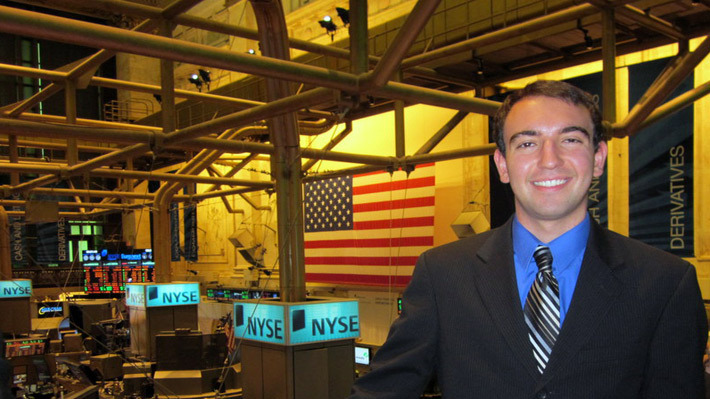 Drexel LeBow Undergraduate Finance and International Business student Joseph Ferreri has accomplished a great deal — and all before his 21st birthday. Ferreri has already completed his first co-op at Blackrock and will soon begin his second co-op with Susquehanna International Group in New York City. By all indications, Ferreri's future will be filled with finance and philanthropy. Some people wait well into their careers for their “aha” moment. Joseph Ferreri already had his — and he’s only a junior. The epiphany came while Ferreri, a pre-junior Business Administration major with concentrations in Finance and International Business, was four months into his first co-op with BlackRock, working for the firm’s Global Trade Operations team in Wilmington, DE. There had been an issue with a trade not settling. Ferreri had been on the phone with the counterparty trying to solve the problem. He was speaking with a co-worker, following up to see what had happened. Nothing extraordinary. Just doing his job. And then it came. “You have it.” That was all Ferreri needed. Ferreri doesn’t just want to make his career. He wants to make a difference. And he’s well on his way. He’s a member of Phi Eta Sigma, the Merit-based Collegiate National Honors Society, the Drexel Finance and Investment Group, Drexel Economics Society, and an alum of LeBow’s Business Learning Community. He is also a former Peer Leader and UNIV101 Teaching Assistant. There is also the summer he spent in Italy and Austria teaching English to children. Or his current stint as an special assistant to Patricia Connolly and Tamika Washington of Drexel LeBow’s Center for Corporate Governance, where Ferreri receives what he calls “extreme exposure” to board members, CEOs and top leadership from large public companies. Ferreri has cultivated a particularly evolved philosophy for a 20 year-old; a personal call-to-action that proves Drexel’s emphasis on global perspective is more than market-speak; it’s living and breathing in Ferreri. “I believe expanding my global outlook is key to my future career success,” he says. Soon, Ferreri will begin his second co-op with Susquehanna International Group in New York City, just steps away from Wall Street. Perhaps he’ll have another “aha” moment. Regardless, he’ll be moving forward with his eyes evenly set on personal development and philanthropy. Ferreri’s grandfather lived with his family for the majority of the budding finance guru’s childhood — and he made a lasting impression. Ferreri admits that he is a devout fan of Saturday Night Live, Shake Shack ‘Shroom Burgers and long-distance endurance runs. Even this guy’s guilty pleasures are grown up. Victor Abiamiri, a former defensive end for the Philadelphia Eagles, was a second round draft pick out of Notre Dame in 2007. This year, when he became a free agent, he joined a new team – Drexel LeBow’s one-year MBA cohort.